Art is one of the ways that people communicate. It is difficult for me to imagine a serious person attacking any means of communication per se. Our real enemies are the ones who send us to die in pointless wars or to live lives which are reduced to drudgery, not the people who use other means of communication from those which we find most appropriate to the present situation. When these are attacked, a diversion has been established which only serves the interests of our real enemies. However, due to the spread of mass literacy, to television and the transistor radio, our sensitivities have changed. The very complexity of this impact gives us a taste for simplicity, for an art which is based on the underlying images that an artist has always used to make his point. As with the cubists, we are asking for a new way of looking at things, but more totally, since we are more impatient and more anxious to go to the basic images. This explains the impact of Happenings, event pieces, mixed media films. We do not ask any more to speak magnificently of taking arms against a sea of troubles, we want to see it done. The art which most directly does this is the one which allows this immediacy, with a minimum of distractions. Goodness only knows how the spread of psychedelic means, tastes, and insights will speed up this process. My own conjecture is that it will not change anything, only intensify a trend which is already there. Does it not stand to reason, therefore, that having discovered the intermedia (which was, perhaps, only possible through approaching them by formal, even abstract means), the central problem is now not only the new formal one of learning to use them, but the new and more social one of what to use them for? Having discovered tools with an immediate impact, for what are we going to use them? If we assume, unlike McLuhan and others who have shed some light on the problem up until now, that there are dangerous forces at work in our world, isn´t it appropriate to ally ourselves against these, and to use what we really care about and love or hate as the new subject matter in our work? 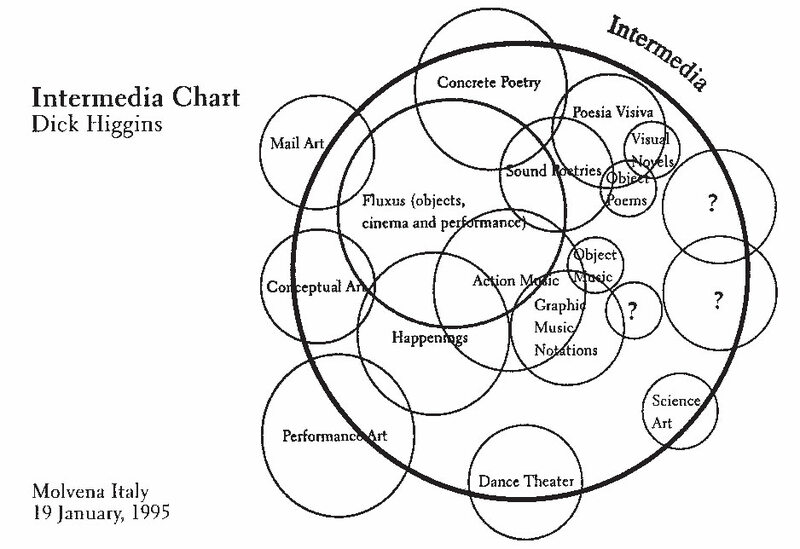 Could it be that the central problem of the next ten years or so, for all artists in all possible forms, is going to be less the still further discovery of new media and intermedia, but of the new discovery of ways to use what we care about both appropriately and explicitly? The old adage was never so true as now, that saying a thing is so don´t make it so. Simply talking about Viet Nam or the crisis in our Labor movements is no guarantee against sterility. We must find the ways to say what has to be said in the light of our new means of communicating. For this we will need new rostrums, organizations, criteria, sources of information. There is a great deal for us to do, perhaps more than ever. But we must now take the first steps. We travel, we see a monument, we take a picture. Framing sites of mass tourism in our viewfinders, we create photographic souvenirs that are integral to the touristic experience. Conducting keyword searches of famed monuments in photo sharing web sites, Swiss / French artist Corinne Vionnet culled thousands of tourists’ snapshots for her series Photo Opportunities. Weaving together numerous photographic perspectives and experiences, the artist builds her own impressionistic interpretations – ethereal structures which float gently in a dream-like haze of blue sky.